Our employees are paid fair wages and and we adhere to sustainable production practices. Major beetle nut farming in Southern India has resulted in millions of Areca palm trees shedding their leaves every year. The fallen leaves add to the region’s agricultural waste. 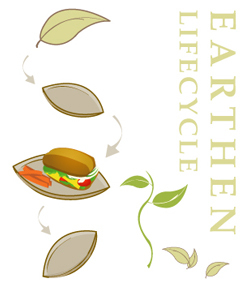 By using Earthen dinnerware, we offer to convert them to disposable composite platesand recycle this waste. Farmers and plantation owners in rural India are able to make additional income from their waste leaves. This product provides healthy and fair employment in rural areas of Karnataka, India. Many of the employees are underprivileged women who would normally find it hard to find work near home. No pollution or smoke is produced while manufacturing Earthen dinnerware. Minimal power is required for heat application. Left-over parts and shreds of the leaves are recycled and used as organic manure.